Have you ever been sucked into the bakery section of a grocery store? When you go into a good one, it’s like being stuck in a black hole of desserts that you don’t want to escape from without at least a souvenir from your traumatic experience. The mini tarts are included in some of these stores, and it’s the variety of colors that draw you in. I tend to linger a little longer than I should, and always feel like it’s a trick question when someone behind the counter asks, “Can I help you?” Ugh. There is no help for me at this point, and I hate you for asking. I’ll take a dozen, please. One day, I stumbled across some Boston Crème Mini Tarts. 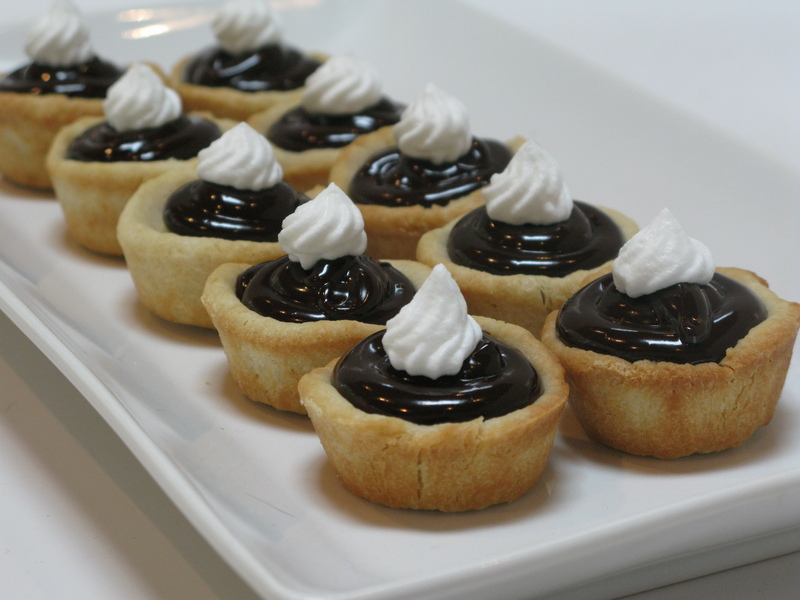 A mini tart shell filled with vanilla pastry crème, topped with chocolate ganache and whipped topping. The black hole suddenly got deeper and more violent. I felt like I was swimming in a sea of vanilla pastry crème and chocolate ganache, eating my way out of it. Don’t even bother throwing me a life jacket because I’d rather drown. Unfortunately, they were made specifically for a private party that had ordered them as a specialty, and they weren’t sold in the store. I wanted to punch the lady when she told me I couldn’t have them. Fine then, I’ll just go home and make them myself…that’ll show her. Although if that happens again, I should call Ronda Rousey for some help. There is a shortcut way of making these, but after I made a tart shell from scratch in culinary school, I was hooked on the buttery sweetness. Even though it’s more time consuming and cuts into my Pinterest stalking, the taste is definitely worth the effort. Sorry, Pinterest. You lose. Not everyone wants or can take the time and effort to make mini tart shells from scratch, and I don’t blame them! 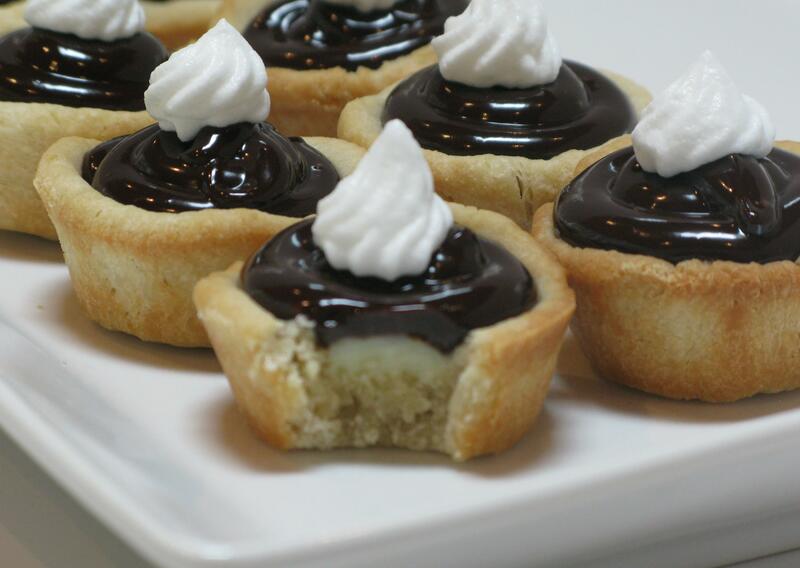 It is more time consuming… But have no fear… You can purchase pre-made mini tart shells! You may have to do some research online to see what stores in your area sells them, or you can purchase them online and have them shipped to your house. Bam. Or, you can use mini phyllo shells, found in the freezer section of most grocery stores, just follow the baking instructions. Just keep in mind that it’s MUCH cheaper to make the shells yourself…and tastier, too. Whisk together milk, vanilla and pudding mix, cover, set in refrigerator for 5 minutes. Stir in whipped topping, store in refrigerator. In a small saucepan, bring cream to a boil. Pour over chocolate chips in bowl, whisk together until chocolate is melted. Here’s the fun part (well, besides shoving these little bad boys into your mouth). Using a pastry bag (or ziplock bag, or a spoon), pipe the pastry crème into the cooled tart shells. Don’t pile it up too high though, you still gotta save room for that chocolate ganache. It’s not Boston Crème without the chocolate ganache. Don’t cheat yourself out of that. Cut butter into small chunks, place in a small mixing bowl and back in the refrigerator. In a large mixing bowl (or food processor), whisk together the flour, sugar and salt. Add cold butter. Using a pastry tool (or pulsing if in food processor),cut butter into flour mixture until it resembles a coarse meal. In a small bowl whisk together yolks, ice water, and vanilla until combined well and add to flour mixture, tossing with a fork or pulsing until incorporated. Form dough into a ball and divide into 2 pieces. Form each piece into a ball and flatten to form disks. Wrap each disk separately in plastic wrap, chill for at least 1 hour and up to 1 week. Form 1 dough disk into twenty-four 1-inch balls, keeping remaining disk wrapped and chilled. Press dough balls into bottoms and up sides of mini muffin pan (about 1 3/4 inches across top and 1 inch deep) using a tart press. Prick bottoms of shells with a wooden pick. Chill shells 15 minutes, or until firm. Bake shells in middle of oven 12 minutes, or until golden, and cool in cups on cooling racks. In a small saucepan, stir together the milk and 1/2 cup sugar. Bring to a boil over medium heat. In a medium bowl, whisk together the egg yolks and egg. Stir together the remaining sugar and cornstarch, then whisk them into the egg until smooth. When the milk comes to a boil, drizzle 1/2 cup into the bowl in a thin stream while whisking constantly so that you do not cook the eggs. Return the mixture to the saucepan, and slowly bring to a bowl, stirring constantly so the eggs don’t curdle or scorch on the bottom. When the mixture comes to a boil and thickens, remove from the heat. Stir in the butter and vanilla, mixing until the butter is completely blended in. Pour into a heat-proof container and place a piece of plastic wrap directly on the surface to prevent a skin from forming. Refrigerate until chilled before using. In a large bowl, whip cream until stiff peaks are just about to form, using electric mixer. Beat in vanilla and sugar until peaks form. Make sure not to over-beat, cream will become lumpy. People don’t like cellulite on their bodies, so they certainly won’t want it in their pastries. Here’s the fun part (well, besides shoving these little bad boys into your mouth). Using a pastry bag (or ziplock bag, or a spoon), pipe the pastry crème into the cooled tart shells. Don’t pile it up too high though, you still gotta save room for that chocolate ganache.